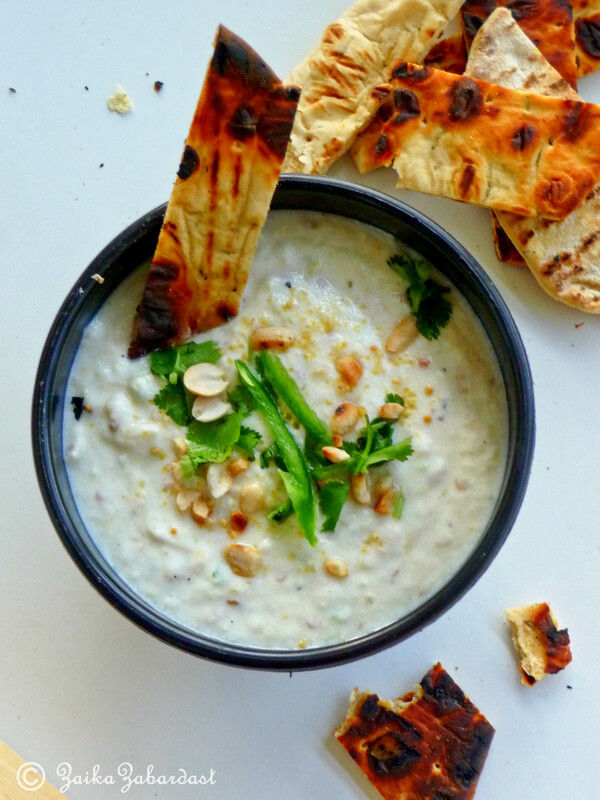 Today I am sharing my family recipe which has been passed to generations from my grandma to my mom, my aunts and so on – Eggplant raita/dip. I learnt it from one of my aunts who still makes the best of all. Every time when the family gets together at my grandma’s place for any type of celebration this condiment has to be there. The meal is incomplete without it. 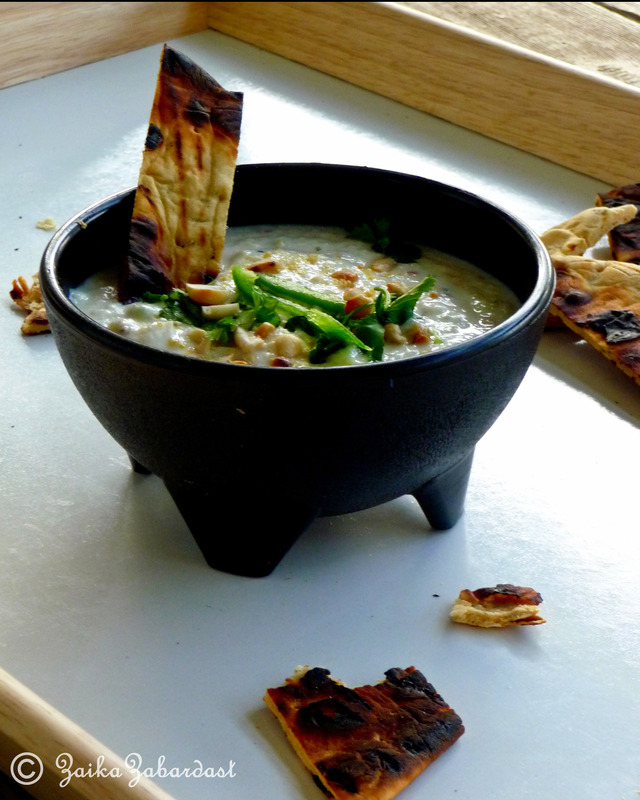 This dip is also one of my favorite condiments that I enjoy with Indian food, vegetables or with grilled pita bread. It is very easy to make and it sure is crowd pleasing. So here’s what we need. 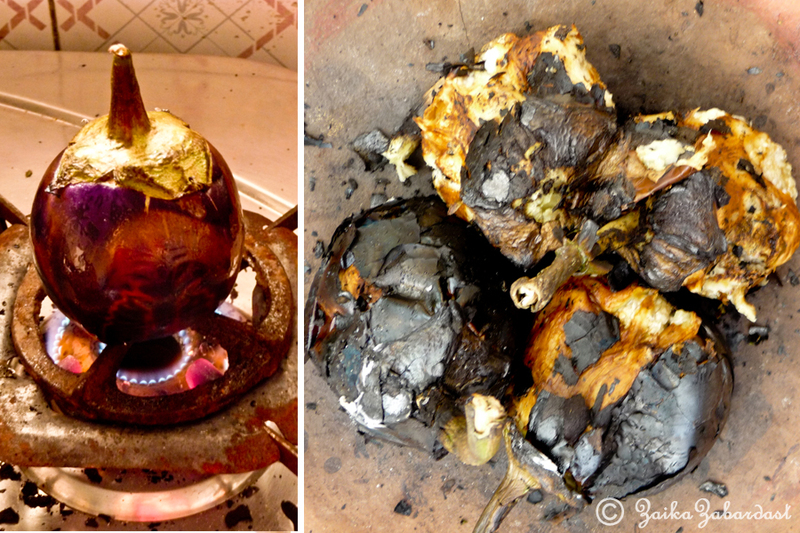 Apply some oil on eggplant and on a medium open flame roast till its skin is burnt and eggplant is soft. Make sure it gets roasted on every side. So keep changing sides. OR roast it in pre-heated oven at 350 F for about 30-35 minutes or until it is soft and roasted. Once roasted, remove from flame/oven and let it cool down a bit before you peel off the burnt skin and remove the stem of the eggplant. In a mixing bowl mash the eggplant using fork and let it cool down completely. In a food processor add peanuts and process twice until it breaks down into tiny pieces. Remove it in a bowl of mashed eggplant and in a same food processor bowl finely process green chilies, garlic and ginger. Add it to the eggplant mixture along with 3 cups of Greek yogurt. Season with salt and mustard. Add chopped cilantro and mix well. Serve immediately or refrigerate it until you are ready to serve. It tastes best when you allow the flavors to develop so if you have time let it sit in refrigerator for an hour or two. Once chilled give it a quick stir and garnish with some peanuts and chopped cilantro. Serve with whatever you like. It goes best with grilled pita, vegetables, steamed rice or anything. I can just eat a bowl full of it right away. It is that comfy! ← Bataka poha and how it unblocked my creativity blockage! Well surprisingly I always have used/had peanuts in my raita since childhood 🙂 I am sure you will love it too. And I can’t agree more with the aroma of roasted eggplant! I am growing eggplant in my garden. I will pin this to remember. Loving your family recipes. I didn’t know you used peanuts in raita. Good twist. You must Angela 🙂 Have it with grilled pita bread, I know you will love it! Something new for me,.looks delicious,..
Grishma, that is wonderful looking. I have not ever been a huge fan of the eggplant…it is not the eggplants fault…it is because until recently I did not have many good recipes using this beautiful vegetable. Now I have another one! Yours! This is a treasure of a recipe and thanks for sharing your family recipe with us. Found this on JustaPinch and let me tell you, this was great! I loved the flavors and texture. The awesome thing was that most of my family enjoyed it as well–and it’s so VERY hard to get them to eat anything except chicken nuggets 😦 Thank you for a great recipe, this is going into my keeper file. Now that brought smile on my face! You are very welcome. I hope you will enjoy Pumpkin Jalebis as well!